Random rambling post - I wanna talk about eyebrow makeup. For the minimalist, its just an eyebrow pencil. 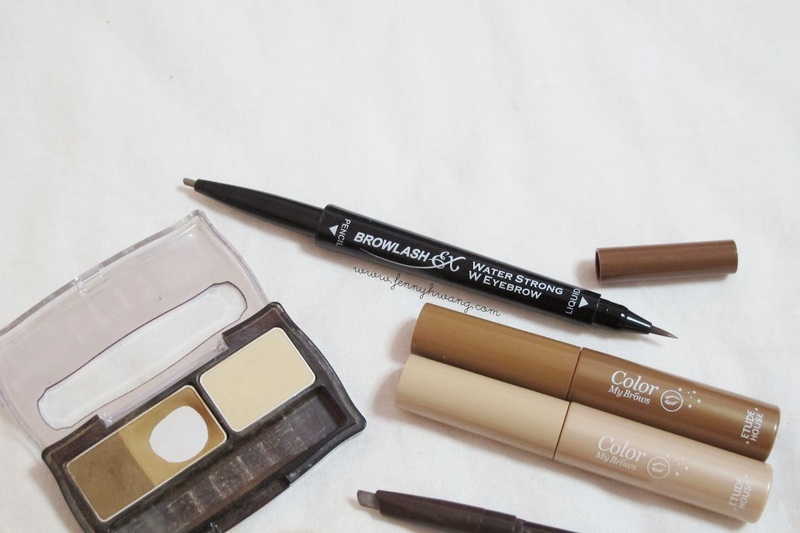 For me, I like exploring the different items so I have a pencil (dayum forgot to picture it, but its Shiseido's Natural Pencil that I pictured here), a crayon type, a crayon type with chiselled tip, liquid type, eyebrow mascaras, eyebrow hair concealer (wtf but yeah) and eyebrow powder. I havn't gotten around trying a gel or wax type, because I thought it'll look too dark or too opaque. Generally the ones in a twist-up pen type are considered crayon type to me, due to its slightly waxy texture. Wax is often used to give that waterproof and oil-proof ability, but it smudges slightly in humid weather because heat melts wax. Nothing really disastrous though. So for me, I like using a crayon type on the front part of my brows, then define the ends with the liquid type, then go over with the powder type. Because my hair is a dark color now, I don't use an eyebrow mascara as mine are all in lighter shades of brown. I feel that this method makes my eyebrow makeup last longer, looking more defined. I totally advise that you use an eyebrow mascara when you have lighter colored hair because it really does help your overall look a lot, that your eyebrow color is matched to your hair. I also recommend Etude House's Coloring Eyebrow mascaras because there are quite a few colors for your to choose from, and the brush makes coating your brows really easy. I hoarded 5 out of 6 of the colors, including concealer, because they're that good!